Social media and search engine optimization (SEO) should be a part of every firm’s marketing strategy today. 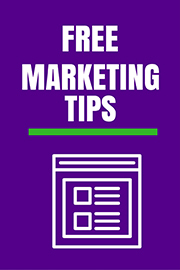 But, are you sure you’re getting the most from your analytics, new social platforms, and SEO to help increase lead generation, the firm’s bottom line, and branding potential? 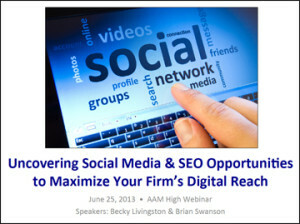 Discovering additional inbound marketing opportunities for your firm using Google+. Understanding how Author Rank influences search engine rankings and inbound marketing. Here are some additional resources (infographics) that support the session content. This one-hour session was recorded by AAM, which is available for download/playback (for a fee). Contact the Association for Accounting Marketers if you would like the playback. If you were a registered attendee, there is no fee. If you would like a copy of the slides, without the recording, please complete the following form to receive a copy of the slide deck (PDF). What questions do you have about using social media, Google+, Author Rank, or analytics for your firm?